Two Time Tony Award Winner®, Chita Rivera, returns in her own show that celebrates her astonishing career. 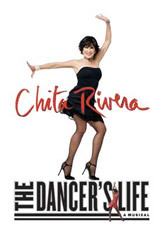 The Dancer’s Life charts Chita’s amazing journey from aspiring ballerina to Broadway Legend. In story and song, she relives fascinating moments from the years she spent working with such greats as Bernstein, Fosse, and Sondheim. And she performs knockout numbers from some of her biggest hits, including West Side Story, Chicago, Bye Bye Birdie, and Kiss of the Spider Woman.